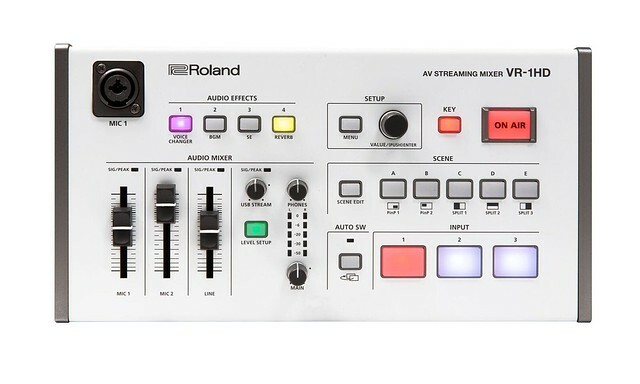 Roland, a leading manufacturer and distributor of electronic musical instruments and professional video products, announces the VR-1HD – a mixer for dynamic multicamera broadcasting to bring your live streaming videos to life. With amazing picture quality and sound that outperforms videos live streamed from just a mobile phone or static webcam, VR-1HD helps content creators engage with their audiences on a whole new level. The VR-1HD will be available in Q2 2019 at Roland retail partners. and line input. The mixer allows users to go hands-free and headset-free while live streaming with a top mounted mic input, so creators can use a goose neck microphone and easily operate the VR-1HD with dedicated controls. VR-1HD’s video editing software provides users with its Scene Switching functionality, allowing them to instantly switch between ‘scenes’ with effortless transitions for a professional finish. The mixer lets creators preset up to five scenes that they can later use while live streaming videos and performances. Video Follows Audio: Provides users with the capability to switch cameras based on who is speaking into the microphone. If both participants speak, or remain silent at once, the VR-1HD can switch to a wide shot capturing both performers. Beat Sync Switching: Listens to the tempo of a performance and automatically selects which camera inputs to switch between. Users can take advantage of preset sound effects, jingles and theme songs and more assignable to Audio Effects buttons, to play during a video or performance. Performers can easily share their content with the same connection technology as a traditional webcam. Simply plug it in to a computer’s USB port for a fully produced live cast or recording and engage with your audience on platforms such as Twitch, YouTube and Facebook.